Many Americans do not obtain adequate amounts of magnesium in their diets. Magnesium is so inexpensive that everyone should consider supplementing at least 500 mg of magnesium daily. 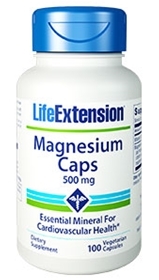 This product provides one of the highest concentrations of elemental magnesium per capsule available on the market. Life Extension's mission is simply to help you live a healthier, longer life. They are at the forefront of medical research, constantly looking for ways to prolong youth, health, and life. They have been at it for more than 34 years, investing more than $140 million to find therapies and technologies that could lead to lifesaving cures for the diseases of aging. Other ingredients: gelatin, magnesium stearate, water. Contains corn. This product contains NO milk, egg, fish, peanuts, crustacean shellfish, soybeans, tree nuts, wheat, yeast, gluten, or rice. Contains NO artificial sweeteners, flavors, colors, or preservatives. Take one capsule one to five times daily with or without food, or as recommended by a healthcare practitioner.